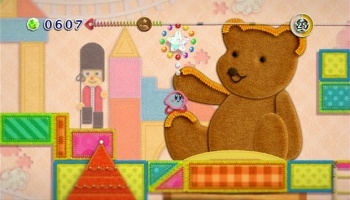 A sound designer at Nintendo's Hal labs said that we may see some other characters using Kirby's Epic Yarn's distinct visual style. Many of the commenters in Susan Arendt's review of Kirby's Epic Yarn mentioned that you could easily drop any character into the game and it would still work. It looks like you guys called it and Nintendo might just take your advice. Speaking to Nintendo President, Satoru Iwata, in his Iwata Asks discussion, sound designer Tadashi Ikegami said that the Epic Yarn visual style could be implemented for any number of Nintendo's characters such as Mario or Luigi. "I think there's a lot of potential for expanding this style to other series, like making a game called Mario's Epic Yarn," Ikegami said. "That's how well I thought the foundation had been laid, so I was really happy that from among all the characters available it was Kirby who was chosen." As soon as Ikegami saw the yarn art style, he knew that it was perfect for Kirby, but was still glad that the little cloud guy was chosen to star in such a vibrant world. But seeing the style also filled Ikegami with envy. "I also thought, 'Aw man!' Envy as a creator that we hadn't thought of it first followed my initial joy," said Ikegami. "As a creator, I was envious, but at the same time I was incredibly thankful to be involved with the project." Perhaps Ikegami was just nervous that he was speaking to his boss, but he did seem to repeat himself there. Buck up Ikegami-san, Kirby's Epic Yarn was a success! I'm sure you will get a few bonus yen this year.